Using technology is such a great way to engage our students. 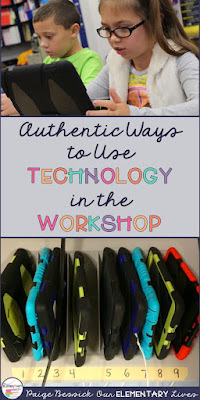 Finding authentic ways to use it can often be challenging. I do not use many commercial apps that just require my students to click. My goal when I'm using technology is for my students to be able to create, connect and collaborate. 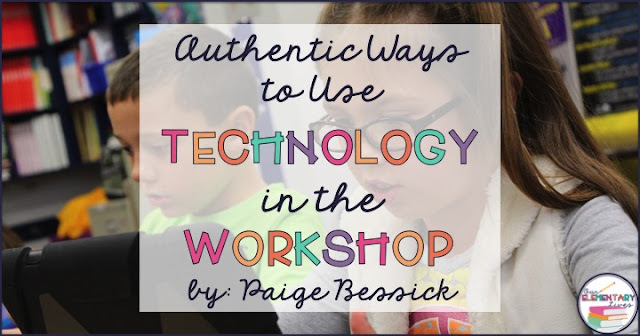 I'm here to share with you how I use technology in my classroom, specifically in the reading and writing workshop. I plan for this to be an ongoing series of blog posts. I will collect all of the posts I write on this topic in this post. 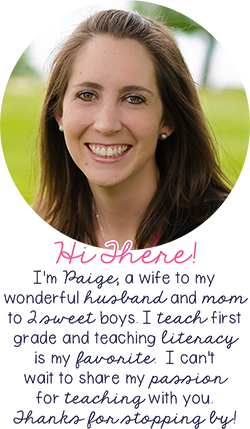 I want to start by sharing some of my favorite technology resources that I use in my classroom. I love this book: Amplify: Digital Teaching and Learning in the K-6 Classroom by Katie Muhtaris and Kirstin Ziemke because they give you ideas and apps of actual activities and projects you can do in your classroom. It's also great because these authors are from Teacher's College, and they teach using the workshop model so all the ideas include a quick minilesson and ways to confer and differentiate for your students. Click >>HERE<< or on this picture to buy the book. This is another great resource for ideas and lessons to use in your classroom. Innovate with iPad: Lessons to Transform Learning in the Classroom. This is a great one for upper elementary and also includes specific lessons and ideas of actual activities you can do in your classroom. Click >>HERE<< or on this picture to buy this book. If you know me or have been following my blog for awhile, you know that I'm that Type A teacher who loves to be color-coded and organized. I was having a hard time figuring out how to keep and organize my iPads, that is until I found this! This Belkin Charge and Store Station has been a game changer. Click >>HERE<< or on this picture to buy. WIth 1:1 iPads (Thanks, Donors Choose), I have 18 iPads that I was trying to organize and make accessible to my students every day. With this charge and store station, each iPad gets its own slot and the charger hides inside. Neat and easy! 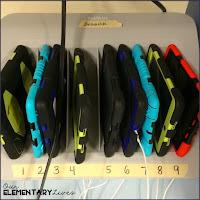 Each of my students has a number and the number they have correlates to one of the iPads in these holders. They know where to get and put back their iPad each time they use it. I just used masking tape (nothing fancy) to mark the numbers. 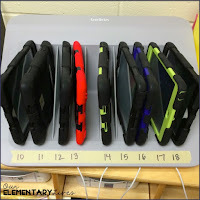 I also keep each of these stations in different spots around the room so I don't have all of my students going to one spot when we all need our iPads. Like I said earlier, these stations have been a game changer. One part of the organization that I don't have under control is our headphones. Right now, they are currently held in plastic bags in a milk crate. We have to transport our headphones to and from technology when we have it every couple of days and this has worked so far. It annoys me though because it is rather messy and if someone needs their headphones they have to dig around and take out all of the other pairs to find their own, which is usually at the very bottom. Am I right?! If you have suggestions on portable headphone storage, please share with me in the comments or email me at ourelementarylives@gmail.com. It is no surprise that I love Apple and iPads. In my classroom, I have iPad minis. They are perfect for my first grader's hands and are just the right size for anything we need to do with them. I also like the Gumdrop Cases. They are sturdy, waterproof and drop proof. We've definitely had our fair share of drops and *knock on wood* we haven't had any damage. 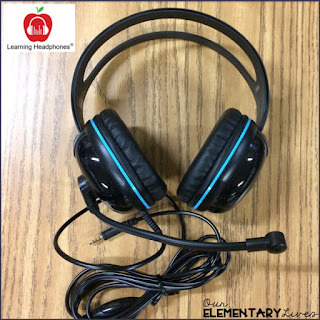 As for headphones, if you've seen this post: The Best Headphones for Your Classroom you know I'm a big fan of headphones from Learning Headphones. 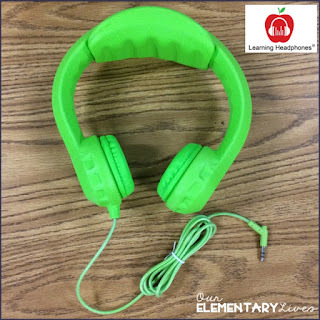 I love that they are sturdy, sound great and that the company is committed to education. You can read my blog post >>HERE<< to find out more information. I have recently tried a couple new types and am just as impressed as I was with the other ones I have from Learning Headphones. These are even better than the other ones I have. Seriously! These are the EDU-455 Over-ear stereo mobile headset. The sound quality and ability to block out background noise is incredible! Its headband is flexible and adjusts to just the right fit for my firsties. This set includes their exclusive noise-canceling microphone which seriously is the best. My students are able to record themselves in a loud classroom and it sounds like they are in a sound booth. I'm also loving these green Flex-Phones Foam Headphones. They are flexible and sturdy and perfect for first graders AND even my 5-year-old. They are nearly indestructible and have been awarded the Scholastic Teacher's Pick Award. Click >>HERE<< or on this picture to check them out! So there you have it, some of my most recommended resources, equipment and organization ideas. I hope you found this helpful. I can't promise I'll write posts in this order, but if you're feeling like one of these really sticks out or you're curious about one of them, let me know and I can write that one sooner. As always, please pin to share with others! Check out the other posts in this series by clicking on the links below. Would love to hear specifically how you use Epic. Thanks!